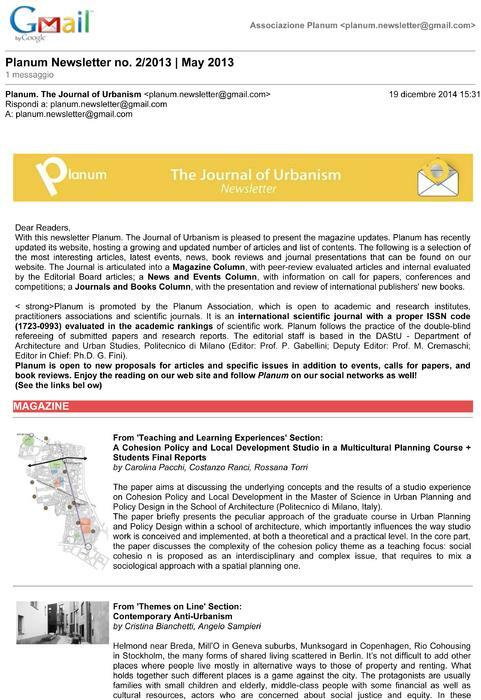 • If you are interested in sending a Newsletter with Planum. 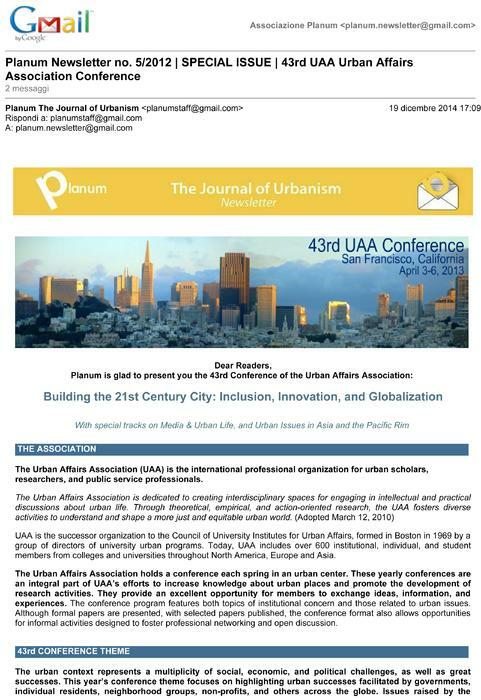 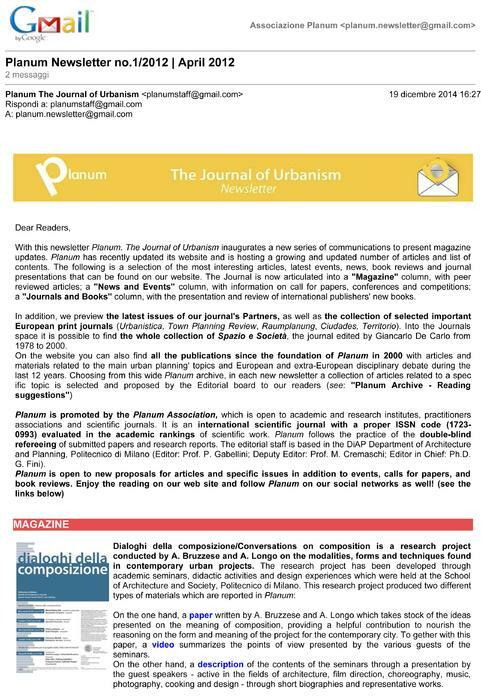 The Journal of Urbanism to our more than 21.000 European contact please visit the Section "About" or contact the Editorial Staff for more information at planum.magazine@gmail.com. 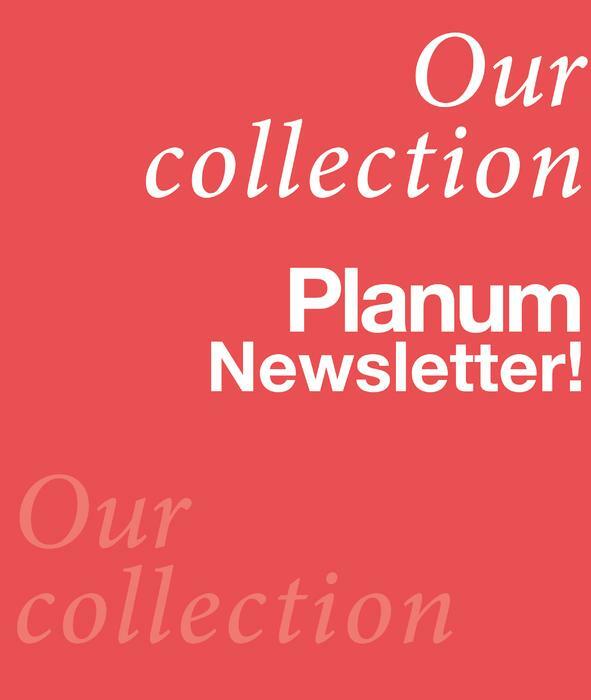 • With this webpage, Planum is pleased to present the complete chronological collection of Newsletters that have been sent between 2011 and 2014 to our more than 21.000 contacts. 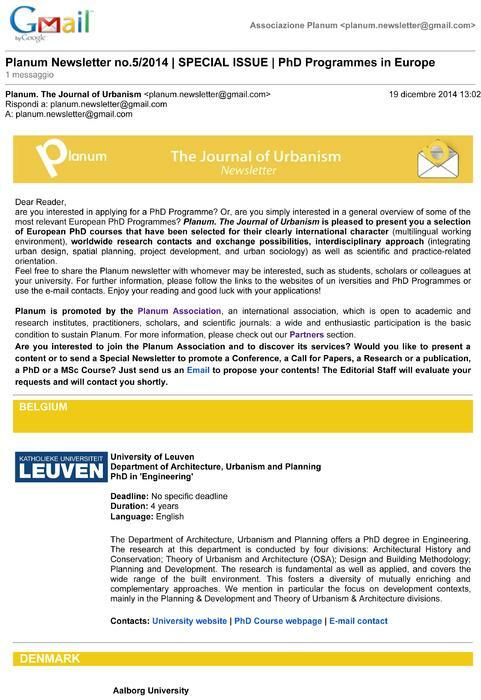 Below you can find all past Planum Newsletters related both to the e-magazine contents (Planum Sections updates) and to some Special Topics (Ph.D Programmes, M.Sc Courses, Workshops & Summer Schools, Conference Proceedings, Reasearch activities, Publications, etc.). 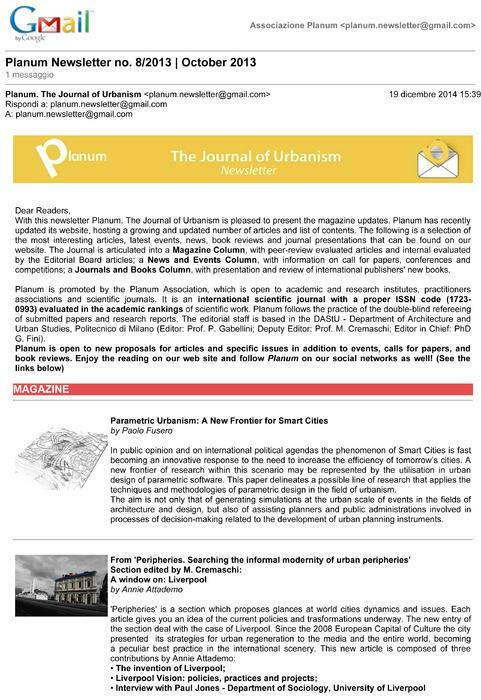 All the Newsletter are rich of tips, suggestions, useful links and contacts! 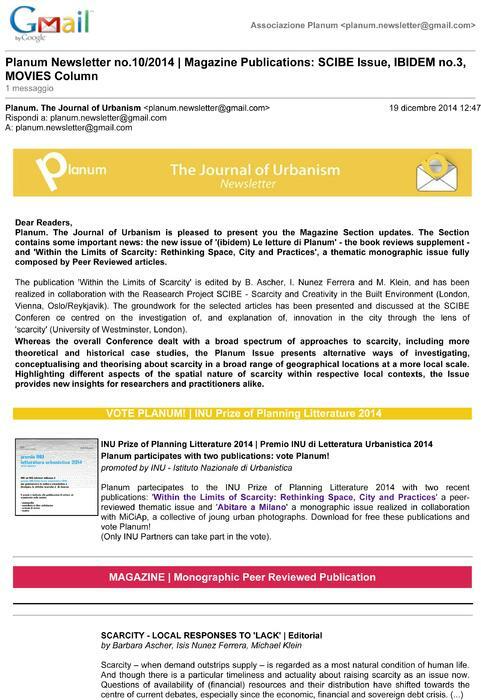 INU PRIZE OF PLANNING LITERATURE 2014 | VOTE PLANUM! 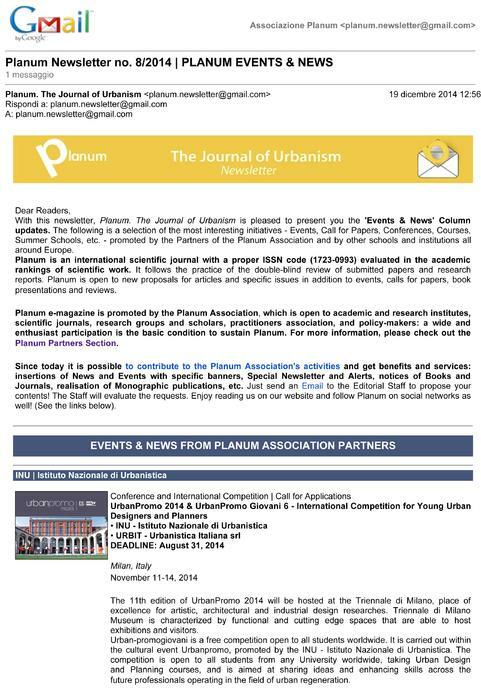 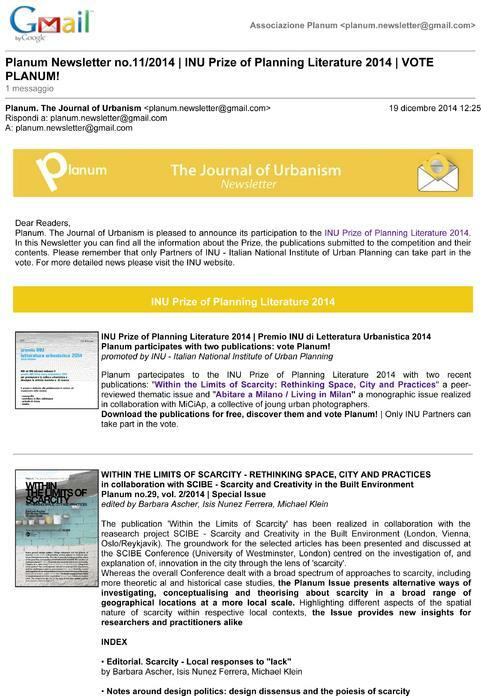 Announcement of Planum participation to the INU Prize of Planning Literature 2014. 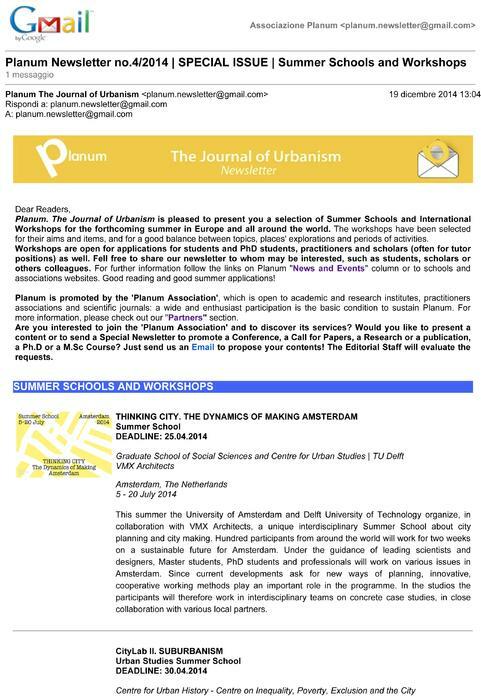 Magazine Section updates and presentation of 'Within the Limits of Scarcity: Rethinking Space, City and Practices' the thematic monographic issue fully composed by Peer Reviewed articles. 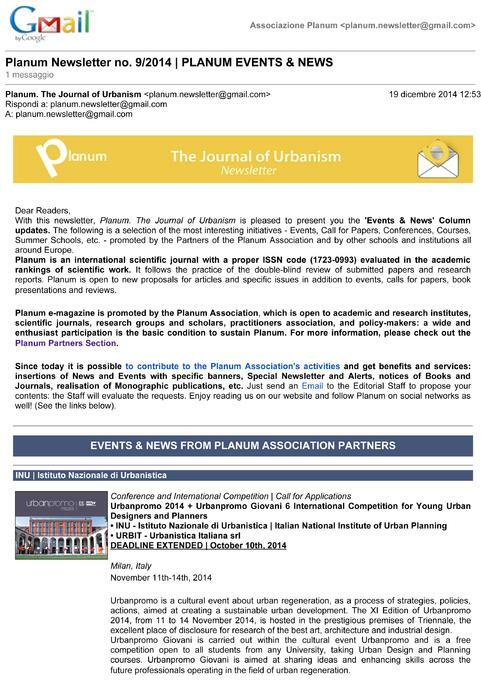 Selection of 'Events & News' Column updates (Events, Call for Papers, Conferences, Courses, Summer Schools, etc) promoted by the Partners of Planum Association and by institutions all around Europe. 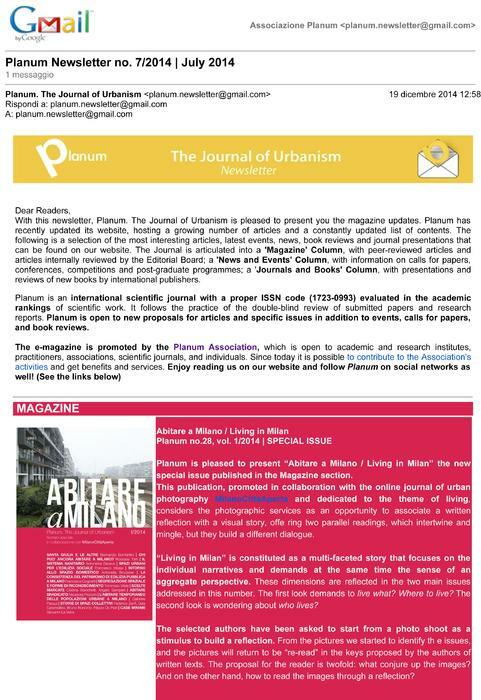 Planum Sections updates and presentation of the special issue “Abitare a Milano / Living in Milan” promoted in collaboration with the online journal of urban photography MilanoCittàAperta. 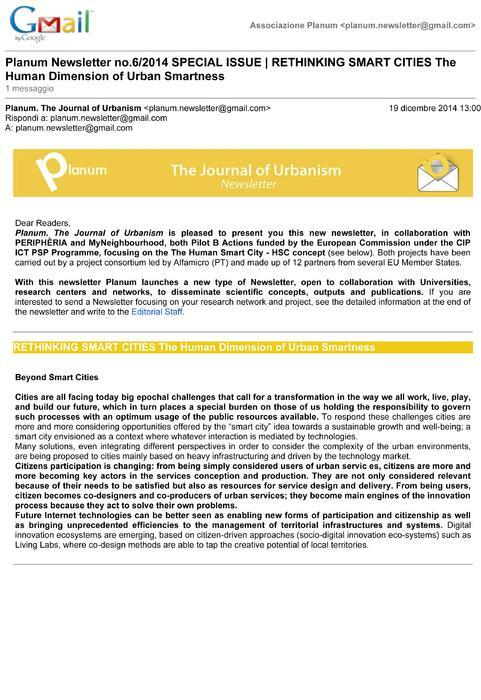 In collaboration with PERIPHÈRIA and MyNeighbourhood, both Pilot B Actions funded by the European Commission under the CIP ICT PSP Programme, focusing on the The Human Smart City - HSC concept. 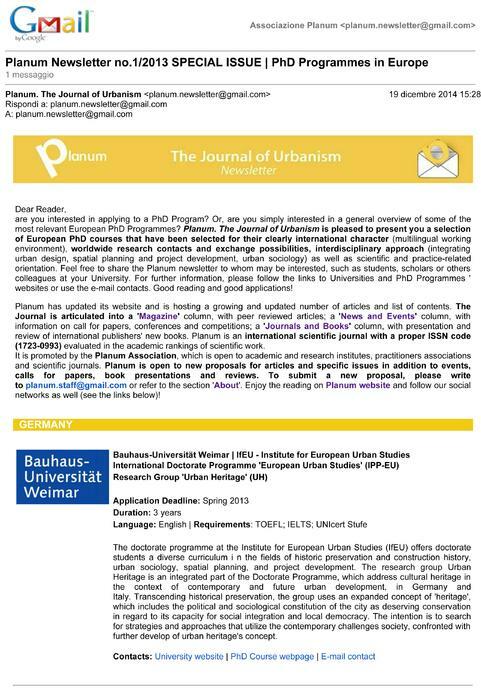 Presentation of European PhD courses selected for their clearly international character, worldwide research contacts and exchange possibilities, interdisciplinary approach. 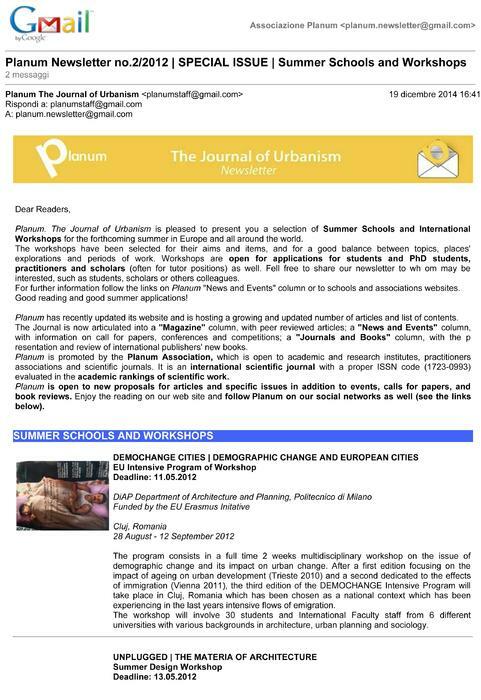 Presentation of a selection of Summer Schools and International Workshops for the forthcoming summer in Europe and all around the world. 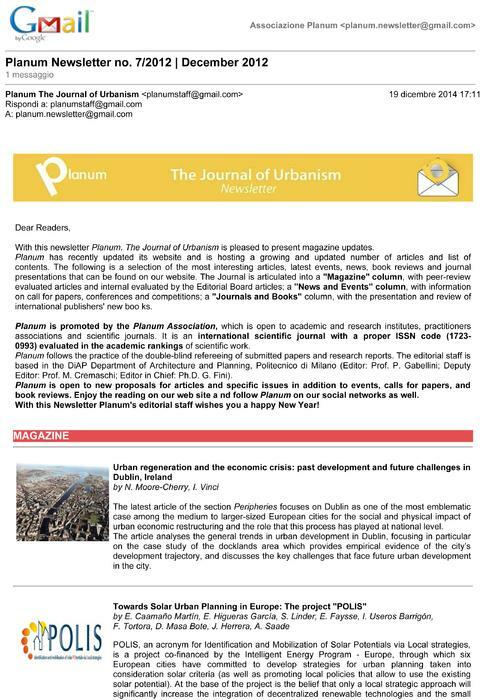 Presentation of the new issue of (ibidem) Le letture di Planum: books supplement of Planum, collection of reviews of both books and places, with a special focus on Italian cities, the landscape and the field of urban studies. 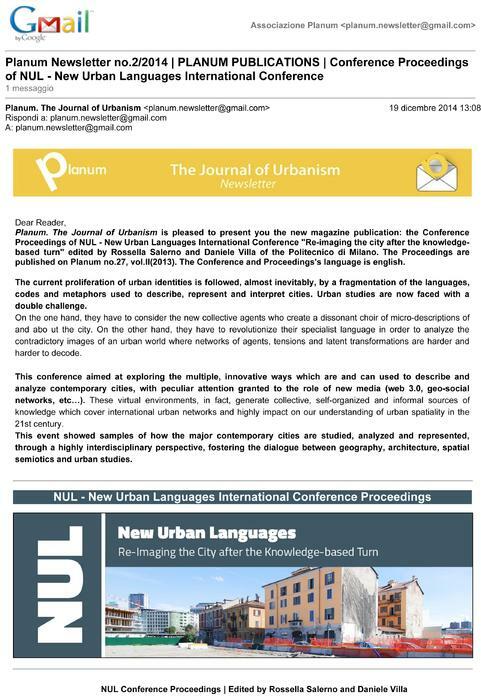 Presentation of the magazine publication: the Conference Proceedings of NUL - New Urban Languages International Conference "Re-imaging the city after the knowledge-based turn" edited by Rossella Salerno e Daniele Villa of the Politecnico of Milan. 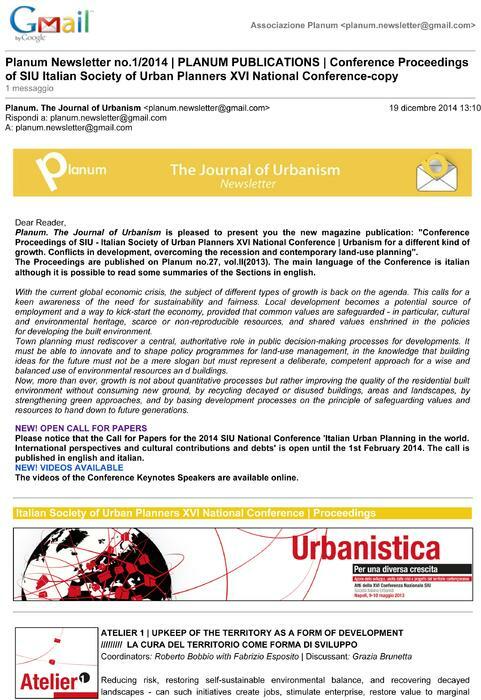 Presentation of a new magazine publication: "Conference Proceedings of SIU - Italian Society of Urban Planners XVI National Conference | Urbanism for a different kind of growth. 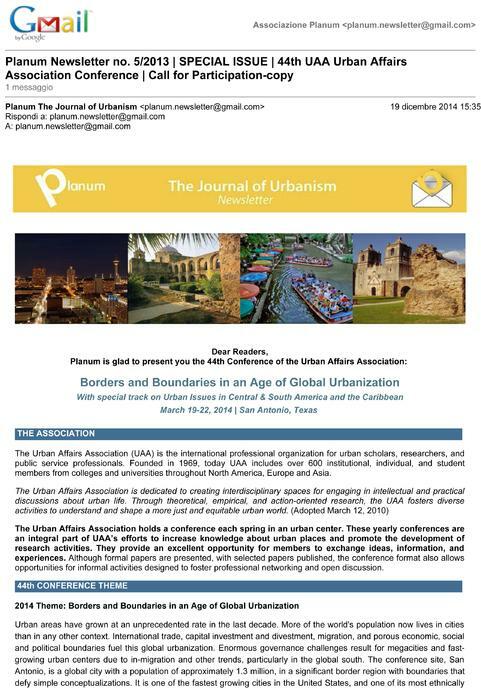 Conflicts in development, overcoming the recession and contemporary land-use planning". 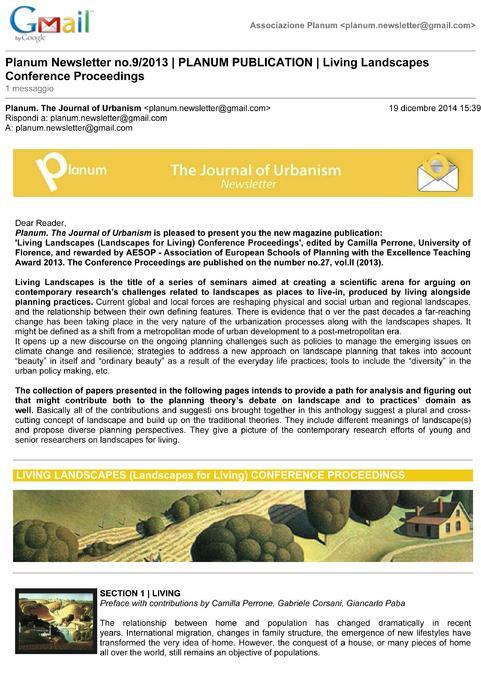 Presentation of the magazine publication: 'Living Landscapes (Landscapes for Living) Conference Proceedings', edited by Camilla Perrone, University of Florence, and rewarded by AESOP - Association of European Schools of Planning with the Excellence Teaching Award 2013. 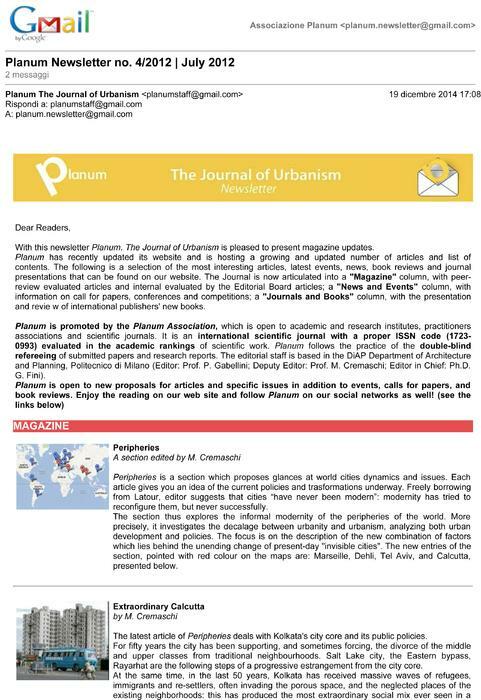 Presentation of the magazine updates with a selection of the most interesting articles, latest events, news, book reviews and journal presentations that can be found on our website: Magazine, News and Events, Journals and Books. 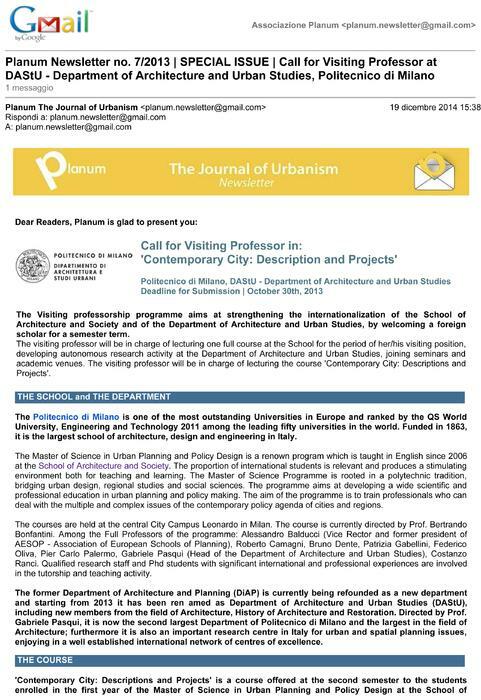 Promotion of the Visiting professorship programme runned by the School of Architecture and Society and of the Department of Architecture and Urban Studies of Politecnico di Milano. 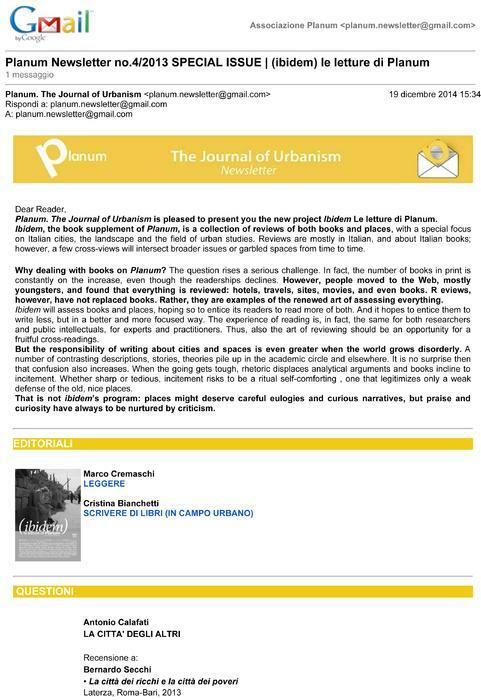 Presentation of the project Ibidem Le letture di Planum. 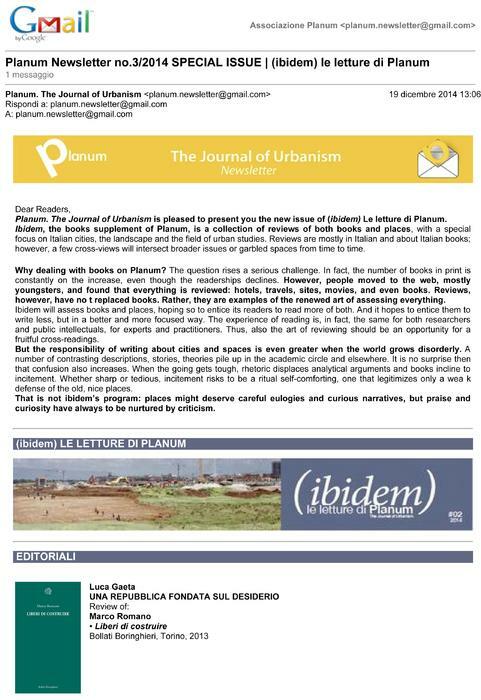 Ibidem, the book supplement of Planum, is a collection of reviews of both books and places. 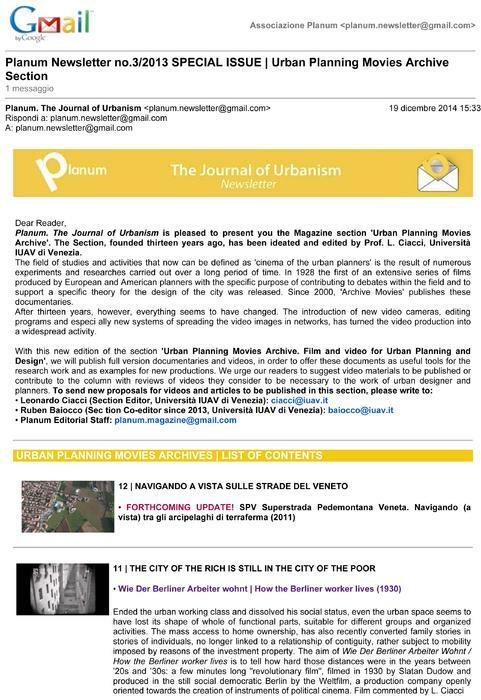 Presentation of the Magazine section 'Urban Planning Movies Archive'. 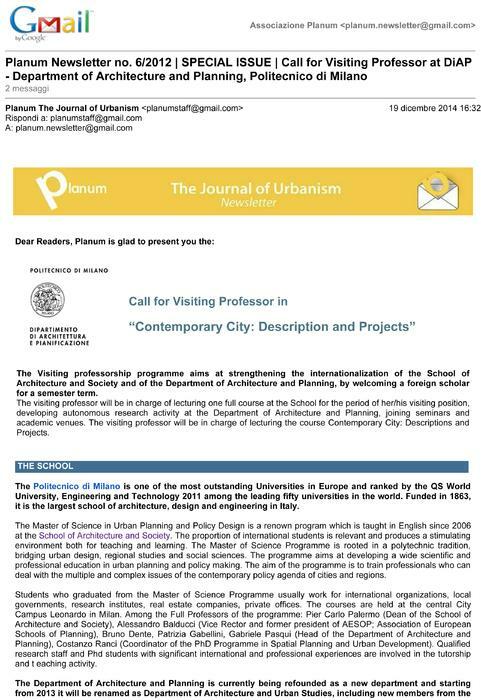 The Section, founded thirteen years ago, has been ideated and edited by Prof. L. Ciacci, Università IUAV di Venezia. 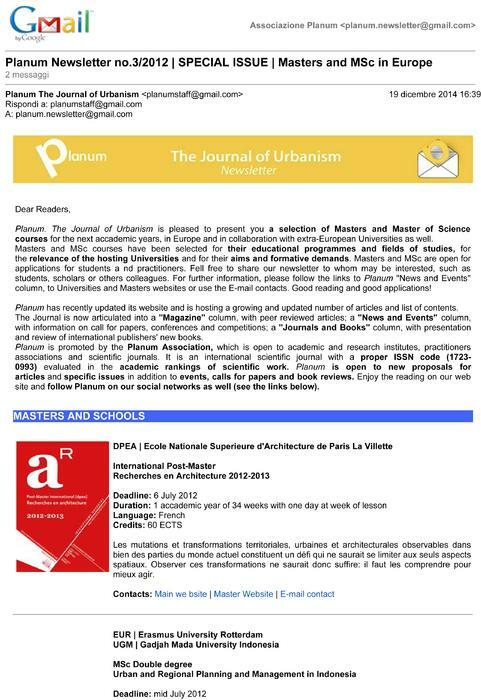 Presentation of a selection of Masters and Master of Science courses in Europe and in collaboration with extra-European Universities as well. 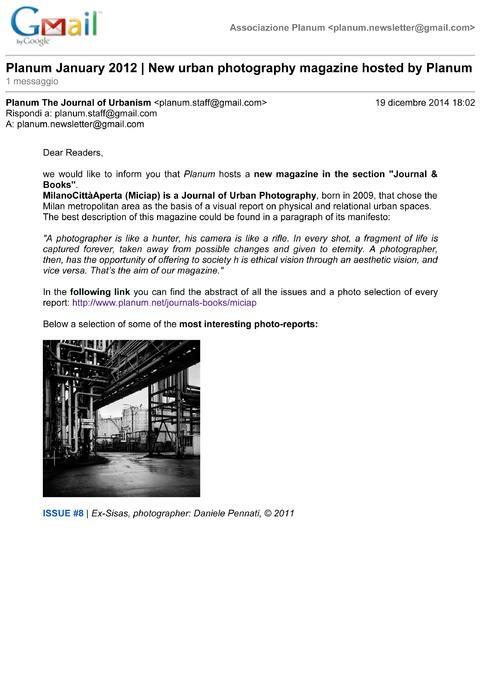 Presentation of the new magazine "MilanoCittàAperta (Miciap)" that is a Journal of Urban Photography indroduced in the Journal & Books section. 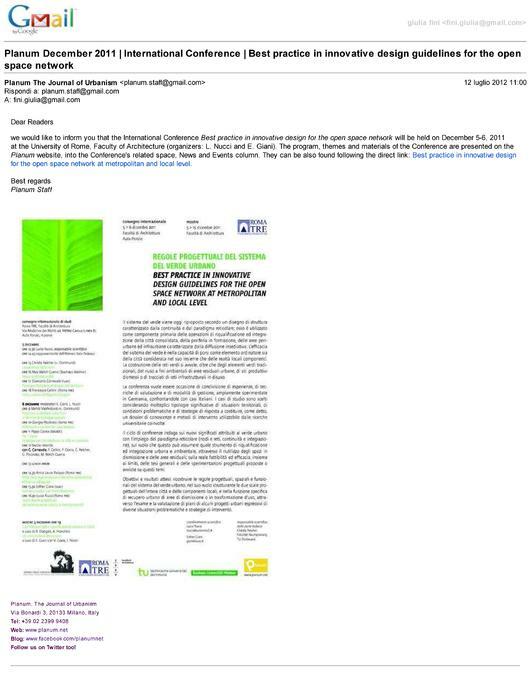 Presentation of the International Conference "Best practice in innovative design for the open space network" will be held on December 5-6, 2011 at the University of Rome, Faculty of Architecture (organizers: L. Nucci and E. Giani).